KUALA LUMPUR (Oct 7): Malaysian exports increased 1.7% year-on-year (yoy) to RM63.88 billion in August. According to the Statistics Department statement today, imports grew 7.6% to RM60.02 billion from RM55.78 billion. 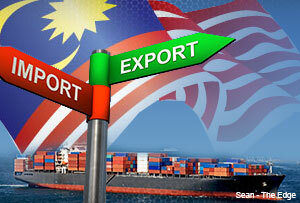 The export and import figures translate into a trade surplus of RM3.86 billion. Total trade rose 4.5% to RM123.96 billion from RM118.58 billion a year earlier. According to the department, export growth was underpinned by higher transactions of manufactured and mining goods. Manufactured goods exports increased 1.3% to RM49.19 billion from RM48.55 billion. The rise came mainly on higher exports of products including electrical and electronic (E&E) besides chemical products. E&E products were valued at RM21.5 billion, which accounted for 33.7% of total exports. Mining goods sales rose 7.5% to RM8.63 billion, contributed by higher export volumes of crude petroleum and LNG. However, exports of agricultural goods decreased 1.6% to RM5.67 billion due mainly to lower exports of crude natural rubber attributed to both lower price and volume, while palm oil exports was affected by lower volume. In geographical terms, Malaysia’s exports to the Association of Southeast Asian Nations region, Japan, the European Union and US rose. Higher exports to these destinations had mitigated the impact of lower sales to China. The department said Malaysian exports to China contracted 21.9% on lower sales of metal, palm oil, electronic integrated circuits and chemical products. Meanwhile, Malaysian imports rose on higher purchases of intermediate, capital and consumption goods. Major imports were E&E, besides petroleum and chemical products. Trade surplus rose 52.4% to RM52.31 billion. August y-o-y export growth of 1.7% had beaten a median market forecast of a 1.4% decline, based on an Reuters survey. Import growth of 7.6% was higher than the polled estimate of a 0.9% rise. Reuters reported that the median forecast of 10 economists polled put the trade surplus at 5.25 billion ringgit ($1.61 billion) for August, up from July's surplus of 3.64 billion ringgit ($1.12 billion).